Do you have 2 or more years of tractor trailer experience? Commercial Truck Quotes LLC values its relationship with you. Your satisfaction is our goal. We are not an insurance company. We simply provide a venue for connecting you with Insurance Quotes. We do not issue insurance contracts or bind coverage. Nor do we endorse or recommend any companies or insurance policies that we connect you with. We do not guarantee that any of the insurance agents, brokers and/or companies to whom we may forward your information will contact you or agree to provide you coverage. Do your own due diligence. We do not do that for you. We are not responsible in any way, for the conduct of the insurance agents, brokers, companies, and/or the employees or contractors of the aforementioned people and entities to whom we forward your insurance quotation requests (Service Providers ). Your dealings with any such third parties will be done entirely at your own risk, and shall be governed by your agreements with the third parties. We do not provide insurance, tax or financial advice. If you need personal advice, explanation of coverage, assessment of needs or specific policy recommendations, you should consult with a licensed insurance agent, broker, or other qualified professional. This Agreement contains an agreement to arbitrate all claims and disclaimers of warranties and liability. You acknowledge that this agreement is supported by reasonable and valuable consideration, the receipt of which is hereby acknowledged. You acknowledge that the consideration includes, but is not limited to, your ability to visit and/or submit information to this Website. You represent that you have the capacity to be bound by this Agreement, or if you are acting on behalf of a company or other entity, that you have the authority to bind such company or entity to this Agreement. You must provide accurate information. If you provide information to Commercial Truck Quotes LLC via this Website, then the information provided must be true, current, and not contain a misrepresentation of your identity. You are responsible for your financial decisions. 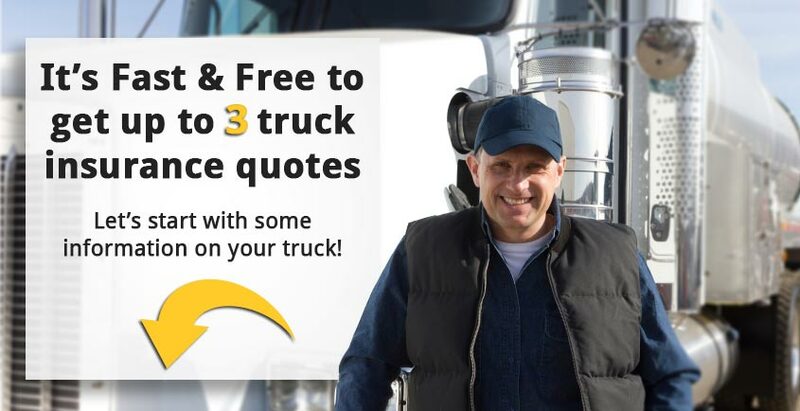 Commercial Truck Quotes LLC provides a venue through this Website by which you can obtain information and find third-party service providers, such as insurance agents, insurance brokers, and insurance companies. Commercial Truck Quotes LLC does not endorse or recommend the products or services of any Service Providers and is not an agent or adviser to you or any Service Provider.We do not validate or investigate the licensing, certification or other requirements and qualifications of Service Providers. It is your responsibility to investigate Service Providers. You acknowledge and agree that Service Providers are solely responsible for any services that they may provide to you and that Commercial Truck Quotes LLC shall not be liable for any losses, costs, damages or claims in connection with, arising from or related to your use of a Service Provider’s products or services. Commercial Truck Quotes LLC urges you to obtain the advice of financial advisers, insurance agents, brokers or other qualified professionals who are fully aware of your individual circumstances before you make any financial or insurance decisions. You acknowledge and agree that you rely on your own judgment and that of such advisers in selecting any products or services offered by Service Providers. You Acknowledge and Agree that Commercial Truck Quotes LLC is Not a Service Provider. Commercial Truck Quotes LLC is not a financial institution, insurance provider or other Service Provider. Â Instead, Commercial Truck Quotes LLC, through the Website, may help to connect you with Service Providers that might meet your needs based on information provided by you. Commercial Truck Quotes LLC does not, and will not, make any coverage or credit decision with any Service Provider referred to you. Commercial Truck Quotes LLC does not issue insurance coverage or any other financial products. No Guarantee of Quotes, Fees, Terms, Rates, Coverage or Services. Commercial Truck Quotes LLC does not make any warranties or representations regarding the quotes, fees, terms, rates, coverage or services offered or made available by Service Providers. Commercial Truck Quotes LLC does not guarantee that quotes, fees, terms, rates, coverage or services offered by Service Providers are the best available. You Do Not Pay Fees to Commercial Truck Quotes LLC. Unless you are a Service Provider or order a specific service through the Website, Commercial Truck Quotes LLC does not charge you a fee to use the Website. Service Providers may pay Commercial Truck Quotes LLC fees for services and to be matched with users of the Website, however. Commercial Truck Quotes LLC is not involved with and is not responsible for any fee arrangement that you may enter into with any Service Provider. You acknowledge and agree to this compensation arrangement. You hereby release Commercial Truck Quotes LLC of any and all losses, costs, damages or claims in connection with, arising from or related to your use of a Service Provider’s products or services, including any fees charged by a Service Provider. The Website may give you the opportunity to request to be matched with and receive quotes or offers from Service Providers (a “Match Request”). Portions of the Website providing this opportunity (the “Match Request Areas”) are only available to residents of the United States, and may not be available in all states. Commercial Truck Quotes LLC make no guarantee that you will be matched with a Service Provider if you submit a Match Request. If you make a Match Request, then you expressly authorize Service Providers to contact you by telephone and/or email at the numbers and addresses provided in your Match Request, for purposes of providing you with the quotes, products and services indicated in your Match Request. You consent to receive telephone calls from Service Providers, even if the phone number that you provided on your Match Request is on any “Do Not Call” list. You also consent to Commercial Truck Quotes LLC emailing you occasionally about your quote request. You are solely responsible for complying with applicable laws and regulations in connection with your use of any services offered by a Service Provider. There may be provided on the Website links to other internet sites belonging to Commercial Truck Quotes LLC’s advertisers, business partners, affiliates, Service Providers and other third parties. Such links do not constitute an endorsement by Commercial Truck Quotes LLC of those internet sites, nor the products or services listed on those internet sites. Commercial Truck Quotes LLC is not responsible for the activities or policies of those internet sites. Commercial Truck Quotes LLC does not endorse or recommend the products of any particular advertiser, business partner, affiliate or other third party. Commercial Truck Quotes LLC does not guarantee that the terms or rates offered by any particular advertiser, business partner, affiliate, Service Provider or other third party on the Website are the best terms or lowest rates available in the market. The content and all services and products associated with this Website are provided to you on an “as-is” and “as available” basis. Commercial Truck Quotes LLC makes no representations or warranties of any kind, express or implied, as to the operation of the Website or the information, content, materials, products or services included on or associated with the Website. You expressly agree that your use of the Website and all products and services included on or associated with the Website is at your sole risk. Commercial Truck Quotes LLC does not make any representations, warranties or guarantees, express or implied, regarding the accuracy, correctness, or completeness of the content or the services and products associated with the Website, nor the safety, reliability, title, timeliness, completeness, merchantability, conformity or fitness for a particular purpose of the content or the services and products associated with the Website. It is your sole responsibility to independently evaluate the accuracy, correctness or completeness of the Content and the services and products associated with the Website. Commercial Truck Quotes LLC makes no representation, warranty or guarantee that the content that may be available for downloading from the Website is free of infection from any viruses, worms, Trojan horses, or other code or computer programming routines that contain contaminating or destructive properties or that are intended to damage, detrimentally interfere with, surreptitiously intercept or expropriate any system, data or personal information. Commercial Truck Quotes LLC does not make any representations, warranties or guarantees, express or implied, regarding any quotes OR OFFERS provided on or through the Website. WITHOUT LIMITING THE FOREGOING, YOU ACKNOWLEDGE AND AGREE THAT COMMERCIAL TRUCK QUOTES LLC IS NOT A FINANCIAL INSTITUTION, INSURANCE PROVIDER, OR OTHER SERVICE PROVIDER. YOU ACKNOWLEDGE AND AGREE THAT COMMERCIAL TRUCK QUOTES LLC IS SOLELY AN INTERMEDIARY BETWEEN YOU AND SUCH SERVICE PROVIDERS AND, THEREFORE, COMMERCIAL TRUCK QUOTES EXPRESSLY DISCLAIMS ANY AND ALL LIABILITY FOR ANY CONTENT, PRODUCTS OR SERVICES PROVIDED BY SUCH SERVICE PROVIDERS. The content is intended only to assist you with financial decisions and is broad in scope and does not consider your personal financial situation. Your personal financial situation is unique and the information and advice may not be appropriate for your situation. Accordingly, before making any final decisions or implementing any financial strategy, Commercial Truck Quotes LLC recommends that you obtain additional information and advice of your accountant and other financial advisers who are fully aware of your individual circumstances. Commercial Truck Quotes LLC shall in no event be responsible or liable to you or any third party, whether in contract, warranty, tort (including negligence) or otherwise, for any damages, including, but not limited to, special, incidental, indirect or consequential damages that include, but are not limited to, damages for any loss of profit, revenue or business, as a direct or indirect result of: (i) your breach or violation of the terms and conditions of this Agreement; (ii) your access and use of the Website; (iii) your DELAY IN ACCESSING OR inability to access or use the Website for any reason; (iv) your downloading of any of the content or the collective work for your use; (v) your reliance upon or use of the content or the collective work, OR (VI) ANY INFORMATION, SOFTWARE, PRODUCTS OR SERVICES OBTAINED THROUGH the Website, OR OTHERWISE ARISING OUT OF THE USE OF the Website, WHETHER RESULTING IN WHOLE OR IN PART, FROM BREACH OF CONTRACT, TORTUOUS BEHAVIOR, NEGLIGENCE, STRICT LIABILITY OR OTHERWISE, EVEN IF COMMERCIAL TRUCK QUOTES LLC AND/OR ITS SUPPLIERS HAD BEEN ADVISED OF THE POSSIBILITY OF DAMAGES. COMMERCIAL TRUCK QUOTES LLC LIABILITY AND THE LIABILITY OF ITS AFFILIATES, DIRECTORS, OFFICERS, EMPLOYEES, INDEPENDENT CONTRACTORS, SHAREHOLDERS, REPRESENTATIVES, AND AGENTS ARISING OUT OF THIS AGREEMENT SHALL NOT EXCEED $100. YOU SPECIFICALLY ACKNOWLEDGE THAT COMMERCIAL TRUCK QUOTES LLC SHALL NOT BE LIABLE FOR USER GENERATED CONTENT OR THE DEFAMATORY, OFFENSIVE OR ILLEGAL CONDUCT OF ANY THIRD PARTY, AND THAT THE RISK OF HARM OR DAMAGE FROM SUCH USER GENERATED CONTENT AND THIRD-PARTY CONDUCT RESTS ENTIRELY WITH YOU. Certain state laws do not allow limitations on implied warranties or the exclusion or limitation of certain damages. If these laws apply to you, some or all of the above disclaimers, exclusions or limitations may not apply to you. You shall defend, indemnify and hold harmless Commercial Truck Quotes LLC and its officers, directors, shareholders, employees, independent contractors, agents, representatives and affiliates from and against all claims and expenses, including, but not limited to, attorneys’ fees, arising out of, or attributable to: (i) any breach or violation of this Agreement by you; (ii) your failure to provide accurate, complete and current personally identifiable information requested or required by Commercial Truck Quotes LLC; (iii) your access or use of the Website; (iv) access or use of the Website under any password that may be issued to you; (v) your transmissions, submissions or postings (i.e., your own User Generated Content); and/or (vi) any personal injury or property damage caused by you. Commercial Truck Quotes LLC reserves the right to update, amend and/or change this Agreement at any time in its sole discretion and without notice. Updates to this Agreement will be posted here. Amendments will take effect immediately upon Commercial Truck Quotes LLC posting the updated Agreement on the Website. Â You are encouraged to revisit this Agreement from time to time in order to review any changes that have been made. The date on which this Agreement was last updated will be noted immediately above this Agreement. Â Your continued access and use of the Website following the posting of any such changes shall automatically be deemed your acceptance of all changes. You agree that any action or proceeding with regard to such injunction restraining such breach or threatened breach shall be brought in the courts of record of Charleston, South Carolina, or the United States District Court, District of South Carolina. You consent to the jurisdiction of such court and waive any objection to the laying of venue of any such action or proceeding in such court. You agree that service of any court paper may be effected on such party by mail or in such other manner as may be provided under applicable laws, rules of procedure or local rules. You agree that: (i) the Website shall be deemed solely based in the State of South Carolina; and (ii) the Website shall be deemed a passive internet site that does not give rise to personal jurisdiction over Commercial Truck Quotes LLC, its affiliates and assigns, either specific or general, in jurisdictions other than the State of South Carolina. This Agreement is to be governed by and construed in accordance with the internal laws of the State of South Carolina, without regard for principles of conflicts of laws. Any civil action, claim, dispute or proceeding arising out of or relating to this Agreement, except for an injunctive action regarding a breach or threatened breach of any provision of this Agreement by you as provided above, shall be referred to final and binding arbitration, before a single arbitrator, under the commercial arbitration rules of the American Arbitration Association in Charleston County, South Carolina. THEREFORE, YOU DO NOT HAVE THE OPPORTUNITY TO GO TO COURT TO ASSERT OR DEFEND YOUR RIGHTS AND YOU GIVE UP YOUR RIGHT TO PARTICIPATE IN OR BRING CLASS ACTIONS. By using the Website you consent to these restrictions. You and Commercial Truck Quotes LLC shall select the arbitrator, and if you and Commercial Truck Quotes LLC are unable to reach agreement on selection of the arbitrator within thirty (30) days after the notice of arbitration is served, then the American Arbitration Association shall select the arbitrator. Arbitration shall not commence until the party requesting it has deposited One Thousand Dollars ($1,000.00) with the arbitrator for the arbitrator’s fees and costs. The party requesting arbitration shall advance such sums as are required from time to time by the arbitrator to pay the arbitrator’s fees and costs until the prevailing party is determined or the parties have agreed in writing to an alternate allocation of fees and costs. Judgment upon any award rendered by the arbitrator shall be final, binding and conclusive upon you and Commercial Truck Quotes LLC and your and Commercial Truck Quotesâ€™ LLC respective administrators, executors, legal representatives, successors and assigns, and may be entered in any court of competent jurisdiction. Notwithstanding the previous sentence, in no event shall either you or Commercial Truck Quotes LLC be entitled to punitive, special, indirect or consequential damages and both you and Commercial Truck Quotes LLC hereby waive your and Commercial Truck Quotes’ LLC respective rights to any punitive, special, indirect or consequential damages, including, but not limited to, damages for any loss of profit, revenue or business. Should a dispute arise and should the arbitration provisions herein become inapplicable or unenforceable, or in any instance of any lawsuit between you and Commercial Truck Quotes LLC, jurisdiction over and venue of any suit shall be exclusively in the state and federal courts sitting in Charleston County, South Carolina. a physical or electronic signature of a person authorized to act on behalf of the owner of the copyright. a description of the copyrighted work that you claim has been infringed. a description of the material that you claim to be infringing or to be the subject of infringing activity and that is to be removed or access to which is to be disabled, and information sufficient to permit us to locate the material. information so that we can contact you, such as address, telephone number and e-mail address. a statement that you have a good faith belief that use of the material in the manner complained of is not authorized by the copyright owner, its agent, or the law. a statement that the information in the notification is accurate and, under penalty of perjury, that you are the copyright owner or are authorized to act on behalf of the owner of a copyright that is allegedly infringed. a description of the materials that have been removed or to which access has been disabled and the location at which the material appeared before it was removed or access to it was disabled. a statement under penalty of perjury that you have a good faith belief that the material was removed or disabled as a result of mistake or misidentification of the material to be removed or disabled. your name, address and telephone number, and a statement that you consent to the jurisdiction of the Federal District Court for the judicial district in which the address is located, and that you will accept service of process from the person who provided notification of the alleged infringement. Only DMCA notices should be sent to the Copyright Agent. The headings contained in this Agreement are for convenience of reference only, are not to be considered a part of this Agreement, and shall not limit or otherwise affect in any way the meaning or interpretation of this Agreement. All covenants, agreements, representations and warranties made in this Agreement, as may be amended by Commercial Truck Quotes LLC from time to time, shall survive your acceptance of this Agreement and the termination of this Agreement. Would you like to add anything else? We only share your info with up to 3 agents. Our service helps you save on truck insurance by bringing up to 3 agents to shop the market on your behalf. Get quotes for all operations and all commodities in all 50 states. Agents compete — you save.